If you’re looking for a TRULY UNIQUE holiday greeting card, you’ve come to right place. 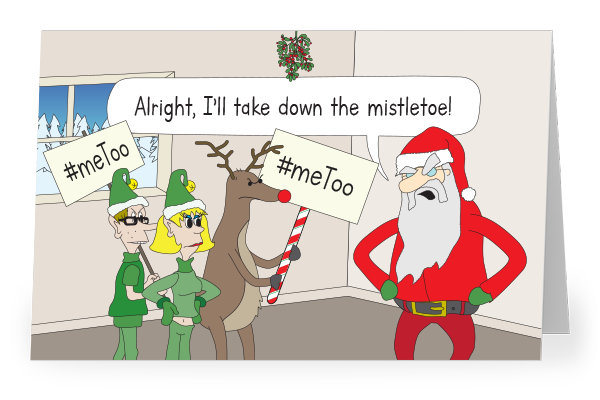 MAKE IT A #METOO CHRISTMAS! Inspired by the #meToo movement, the elves are finally speaking up. Just say no to mistletoe. A red nose is not consent. And for the last time Santa, no one wants to see your north pole. 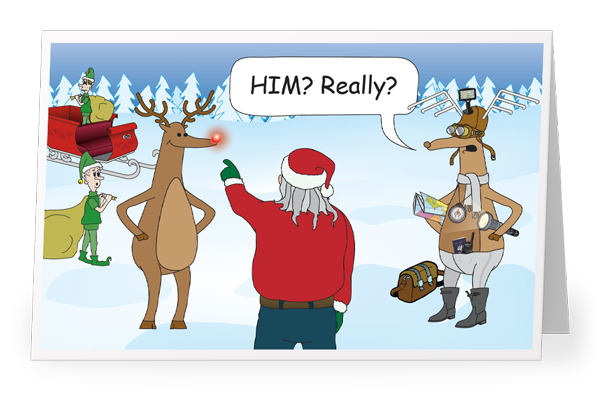 Some say that reindeer helped make the North Pole what it is today. 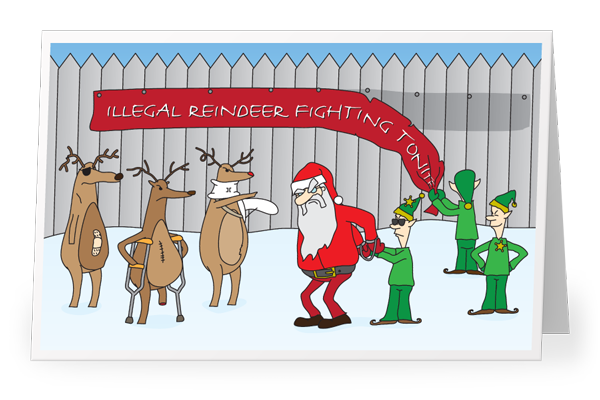 Others believe that reindeer are job-stealing terrorists. 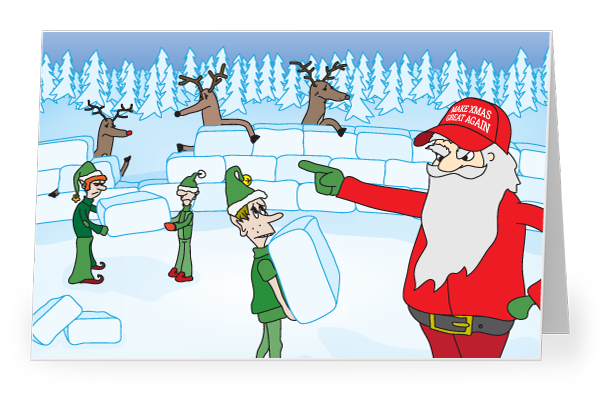 Whichever side of the wall you find yourself on, this card is the perfect Christmas Greeting for divisive times. BRAND NEW FOR XMAS '15! In Canada, 2015's federal election had most of us VOTING red, and the rest of us SEEING red... but whichever side you were on, you and your card's recipient are sure to chuckle at this holiday version of everyone's favourite campaign ad! 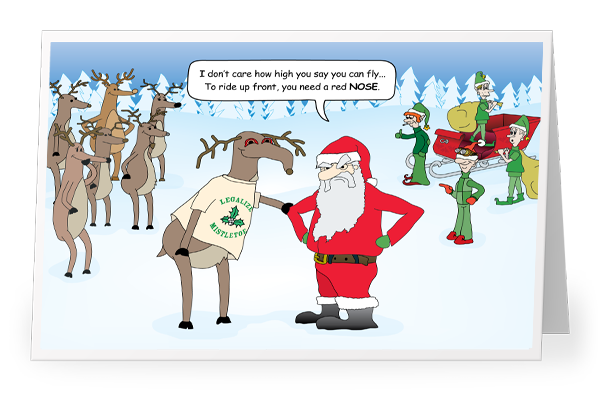 “Dude... where's my sleigh?” Rudolph is flying high in this new Christmas Card - the perfect card for the stoner in your life. 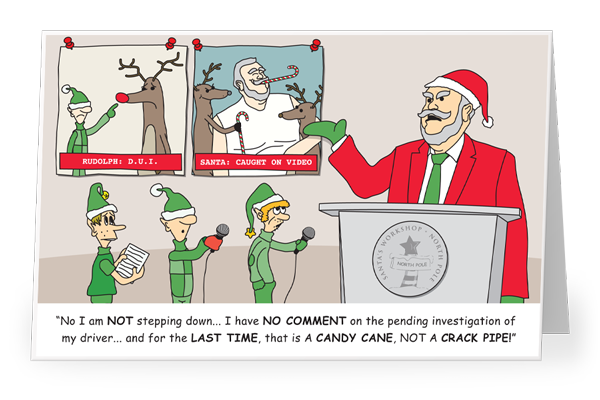 “That is a candy cane, not a crack pipe!” Love him or hate him, Toronto’s mischievous mayor playing Santa is guaranteed to put a smile on your face this Christmas. He teaches reindeer to fly and elves to be short. He boasts a magic sack but IS allowed to frequent shopping malls. He knows when you’ve been naughty or nice, but he also knows you've never been nice, but he still gives you presents. 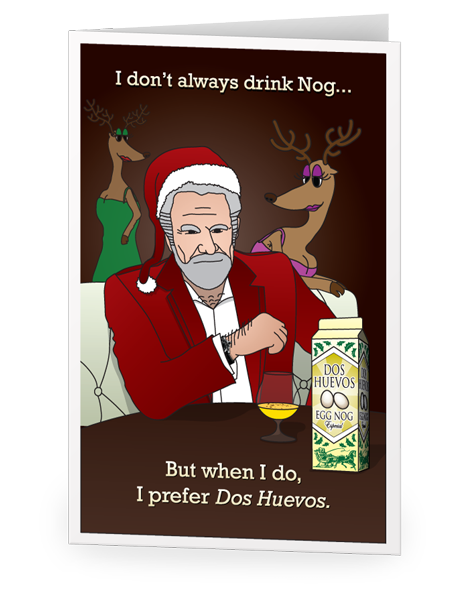 He is the most interesting man in the North Pole - and this is the only Christmas card for the most interesting man in your life. 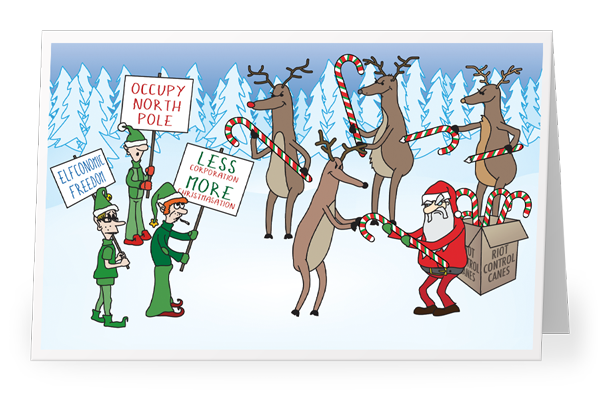 A chilling winter scene in which Santa has had enough with the Elven Occupiers and has finally decided to evict them from their North Pole Protesting in the traditional yuletide manner. If you’ve been unfairly passed over for anything this year, this card is for you. inside: "Holiday Traditions: whether you embrace them or merely endure them... just try to enjoy them." 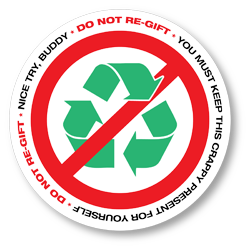 These handy stickers make re-gifting easier than ever: stick them on the crappy gifts you give or receive to indicate that this crappy gift is ideal for re-gifting! 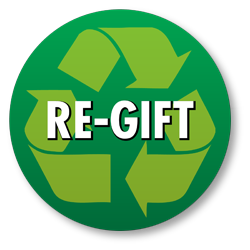 Remember to add one each time the re-gift changes hands, so as to indicate the number of times it has been re-gifted. 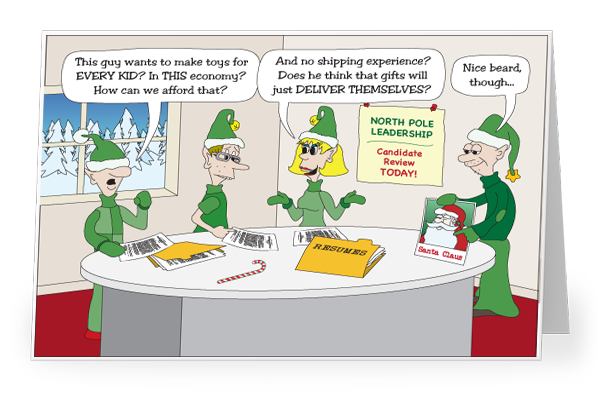 OR... are you tired of people lazily re-gifting your well thought out gifts -- or your lazy re-gifts, for that matter? These handy stickers make it easy to indicate "hey, this gift is for YOU, sucker -- don't try passing it off to some other sucker when you're feeling too cheap to shell out for a gift card!" on the gifts you give this season. 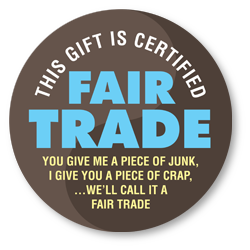 Put this sticker on any gift to officially certify it as 'fair trade' -- as in 'you give me a crappy gift, I give you a crappy gift... and we'll call that a Fair Trade!" Give this card to your sweet-heart this year, and I can guarantee they will look at you like they’ve never looked at you before. 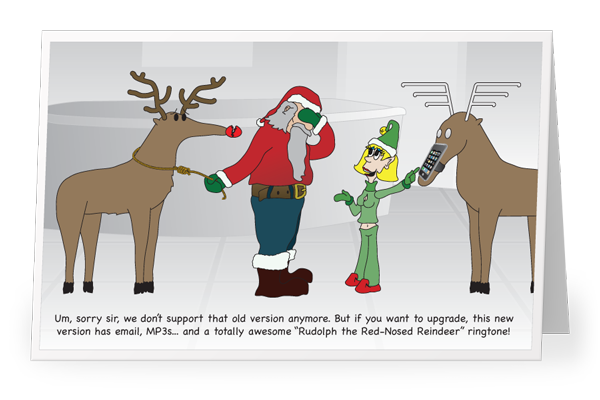 This year, Mrs. Claus has been “naughty” by treating Rudolph too “nice”... This one is wrong on so many levels. 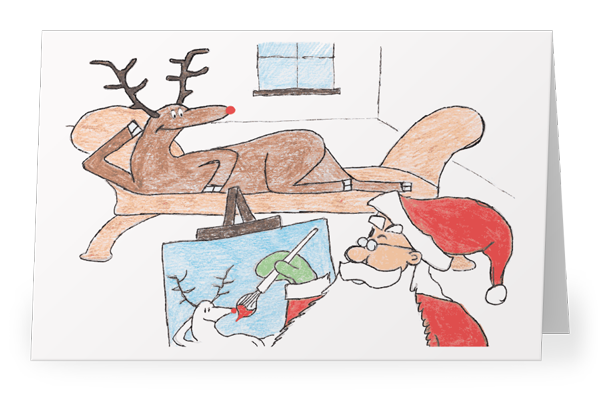 When Santa decides only a hand-made gift will do for his favourite reindeer, things get a little too real. 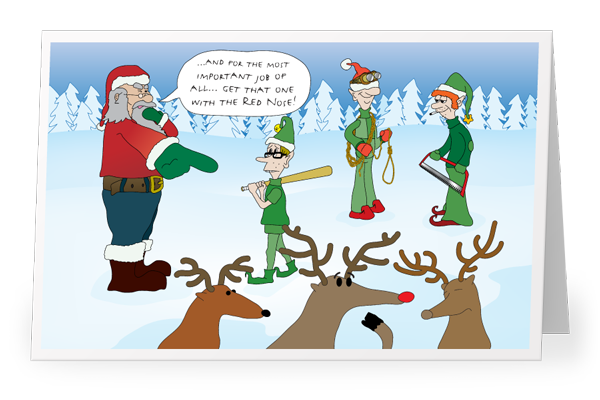 Rudolph with your nose so bright, won’t you get in the ring and fight? 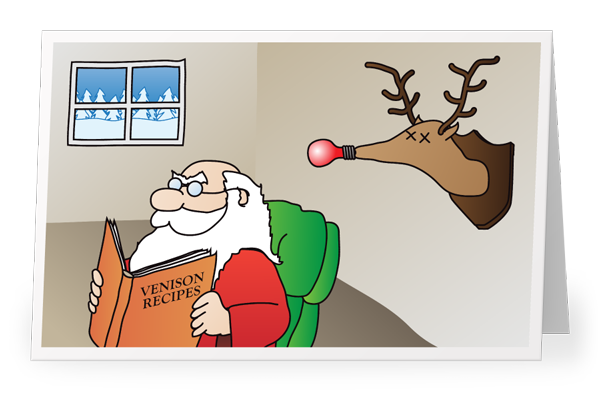 Santa gets a raw deal and Rudolph goes all-in for the win. 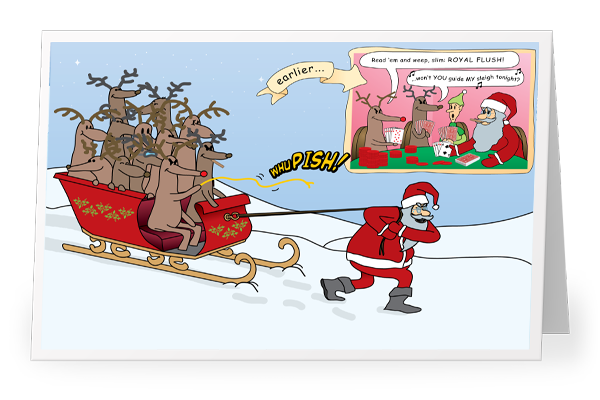 inside: Wishing you a happy holiday season... and better luck in the new year! 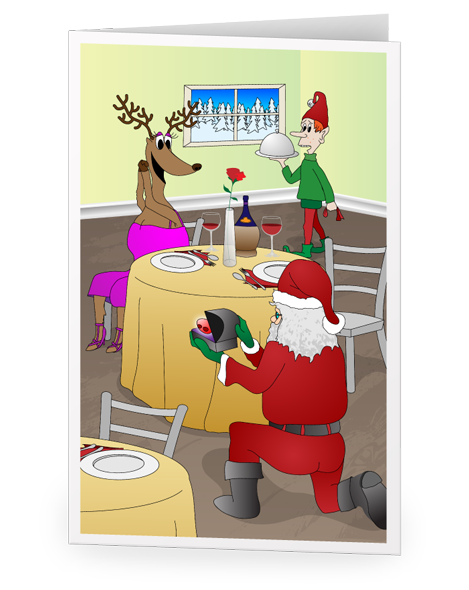 Download this one for free and see for yourself what Santa has in store on the inside of this card. 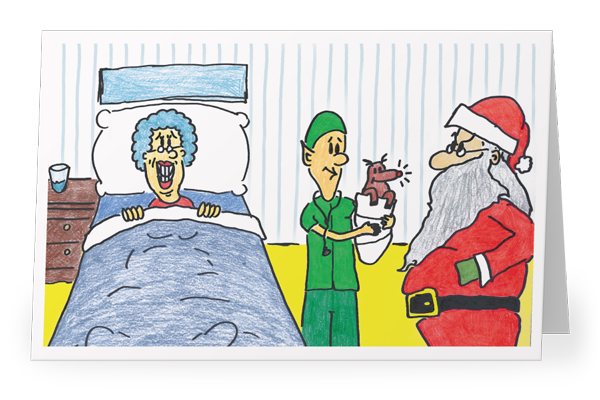 We’ve all been there before... you’ve got a “Kris Kringle” gift exchange at the office, but your choice of card gives you away - now they know who bought them the crappy gift! 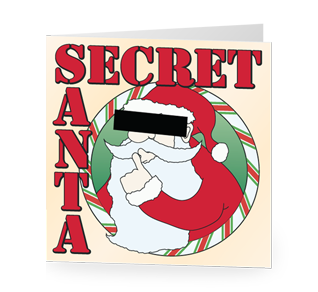 But NEVER AGAIN with our handy Secret Santa gift tags, guaranteed to tease and please.